Ever since I began introducing retinol into my skincare routine, the results have been quite remarkable. All of the retinol products that I use are over-the-counter and less powerful than prescription strength retinoids but nonetheless I have found quite a few that deliver great results. Obviously many people associate retinol products with anti-aging because of their ability to resurface the skin, exfoliate and help prompt surface skin cells to turn over allowing for new cell growth underneath. But there are many other benefits to using retinols that I've discovered such as the ability to help prevent and treat acne and breaking up discoloration and/or dark spots. I've been pretty head over heels for this retinol product recently, but I am happy to have found two other retinol products that worked for my skin. 1. 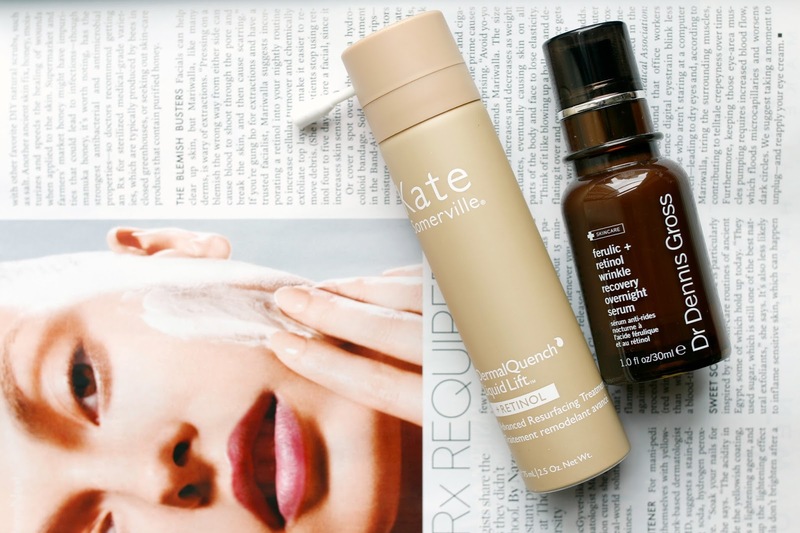 Kate Somerville DermaQuench Liquid Lift with Retinol - Let me first start by saying that the texture of this product is one that takes some getting used to. If you are a regular Kate Somerville user, you may be familiar with this delivery system. The product comes out in a cold foam and then breaks down to a liquid that you apply to the skin. I, however, love a unique texture in skincare so I was immediately intrigued. What also made me love this product was that it can be added in as a booster before your serum. The formulation is so thin and watery that I pairs well under any serum and is a great way to add in retinol without having to substitute it for something else. I usually follow this up with a hydrating serum and night cream (loving this one at the moment), but when I want to amp up the results I may use another anti-aging serum or moisturizer after. For me, the most noticeable results were on my breakouts which after just 3 nights appeared minimized and less red, and my skin looked incredibly fresh and glowy. Some retinol treatments can irritate the skin or dry it out a bit, but I found the complete opposite with this one. My skin stayed hydrated, soothed and never got flaky or red. The combination of the strong retionol ingredients in a hydrating formulation makes this a product an winner in my book. 2. Dr. Dennis Gross Ferulic + Retinol Wrinkle Recovery Overnight Serum - If the unique foaming texture of Kate Somerville's Liquid Lift is not for you, this traditional serum formulation may be more up your alley. Formulated with retionol and ferulic acid, this overnight serum helps to address wrinkles, firmness and will work to retexturize the skin. While firmness is still not my number one issue, over the past few years I have noticed a slight decrease in elasticity and therefore products that target this concern provide a more noticeable difference to me than ever before. 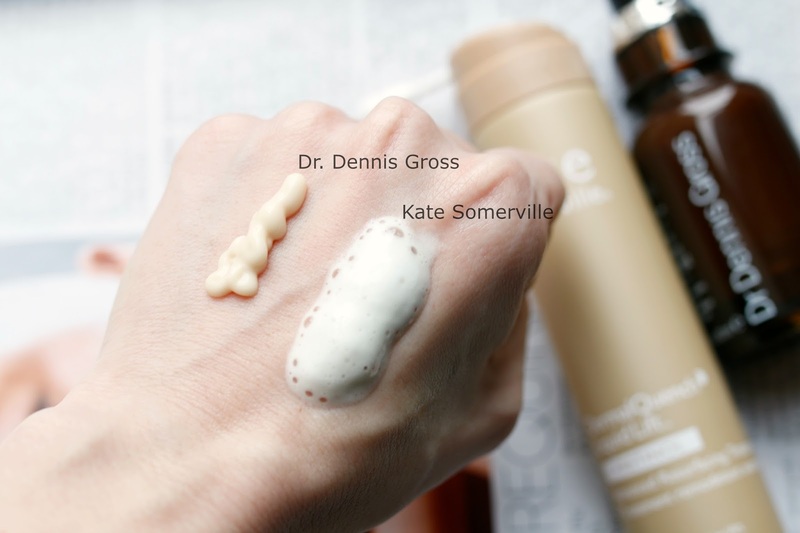 While the initial results for the Kate Somerville Liquid Lift were on my breakouts, this Dr. Dennis Gross serum first showed a change in the firmness of my skin. Each morning it looked taut and smooth, and there was a noticeable difference in the way my makeup looked after being applied. It wasn't until about day 10 or 11 that I began to see a change in my acne. Breakouts cleared up, and recent blemish scars were almost gone. I only had a tiny bit of dryness after 6 days straight of using it, so I switched it up to every other night and the issue of flakiness went away immediately. There are a few products in this Ferulic + Retinol range so if you fall in love with the serum, there are a ton of other items to add to your arsenal. I am currently testing the peel from the range and will have a review on that shortly! I love Retasphere from Kate, will have to give this one a chance!